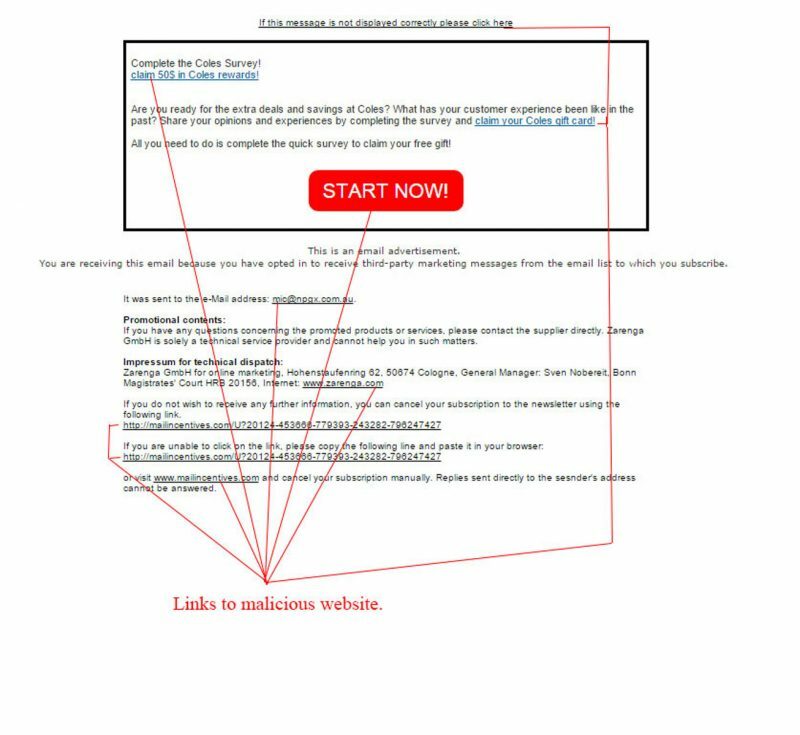 Coles (an Australian supermarket) has again been targeted with a survey reward scam email encouraging the receiver to click through to a malicious website. There are many hidden dangerous links in this email. Be cautious and delete it from your inbox if received. Figure A shows the email in question. It is very text heavy and has a red call-to-action pushing you to start the survey. Do not click this button or any of the text links in this email – they are all malicious links. The subject line reads “Congratulations on your Coles Survey Reward” and it is said to be sent from “Coles Coupons” however, when looking at the email address it is in no way associated with the official Coles supermarket website. all prying for your personal details. This email is an attempt to lead you to a dangerous website that will infect your computer with malware. Be very wary when receiving emails of this nature and if you receive this one delete it immediately and do not click any links.